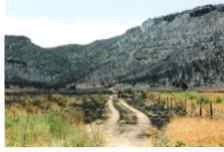 This is Moorland Canyon, the original Moorland homestead (At the last curve in the road before the State Line), after the Triangle Fire. That was not the first time it was a hot spot. 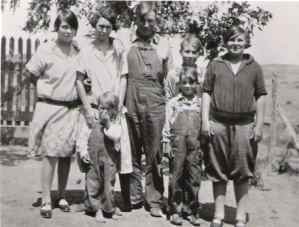 Robert Newton "Bob" Moorland settled there with his family and developed the homestead. When his father, Newton B. Moreland, sold the homestead to Jim Waring, there was gunplay between father and son. Robert moved his family to the Lane Place, on Coates Creek, and changed his last name to Moorland. 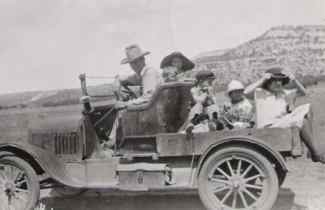 Bill also raised his family on what is now called the Coates Creek Ranch. 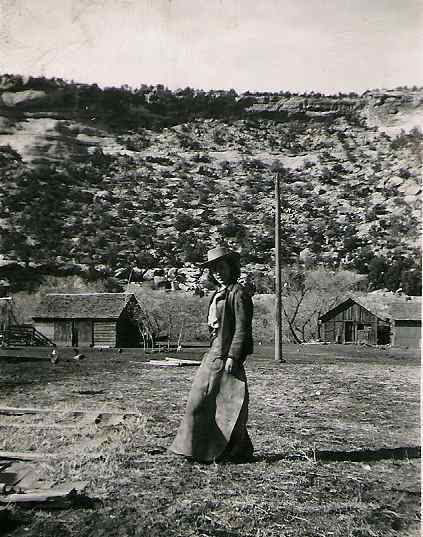 Bill and Erma Moorland at Mahoney Ranch. Bill is riding Sharkie, the wild horse he caught, trained, and gave Erma for a wedding present. Erma is riding Chopo, a horse her family brought with them from the Disappointment Valley. Memorial to Robert Newton "Buster" Moorland, Jr.